At the Professional Outdoor Media Association Conference this past August I received several of the Camp Traditions soup mixes. The cold, rainy January day seemed like the perfect weather for a hot bowl of soup. I may not have been out camping, but decided to try the mix. I discovered this product is a real winner. 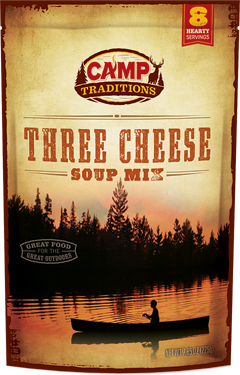 Camp Traditions offers several varieties of soup mixes made to cooked in the great outdoors while camping or hunting – just add water! I give the Three Cheese Soup Mix five stars for taste and flavor. My concerns are the preparation of this particular mix while camping and need to add protein to make this a full meal. The first part of making the soup is easy enough – JUST ADD WATER. 7 1/2 cups of water to be exact. Don’t have a measuring cup in your backpack? No worries. Just fill the empty pouch completely and then do it a second time filling it almost all the way full. The amount of water does not have to be exact – more water makes a thinner soup and less water makes it thicker. Now here comes my first concern regarding this wonderful mix: you really need a whisk to get it creamy. The package even says “Use a whisk if you have one.” I used the whisk to get a nice soup that I would serve at a dinner party. No lumps or pasty taste – the soup is a nice blend of cheddar, blue, romano and parmesan cheeses. I know that is four cheeses. I guess the name Three Cheese Soup Mix sounds better. My second concern about this product is the lack of meat or carbohydrates. After a long day hunting or hiking, you may need to add meat or pasta to make this a complete meal. At home this is a great starter or perfect with a salad for lunch. To make this a complete meal you can add extras like sausage, venison, ground beef, pasta or potatoes. Total cooking time is 25 minutes and preparation time is just about one minute. Have the time at home? Try this mix in a crock pot and let the aroma fill your house. One pack of the mix makes 8 eight large bowls (8 fl. oz each) and is low in calories at just 130 per serving with 3.5 grams of fat. Not much on the protein, sodium or carbohydrate side. It’s a nice, light soup that was perfect for this cold Winter day. Easy preparation and a long shelf life make this item perfect for your pantry. Stock up and be ready for your next camping trip. I have the other mixes and will try those out this week. I can’t wait for the chili mix. Garlic Potato is on the list as well as the Barley Beef. Bottom line: The Three Cheese Soup Mix is healthy, easy and tasty. Don’t camp without it! 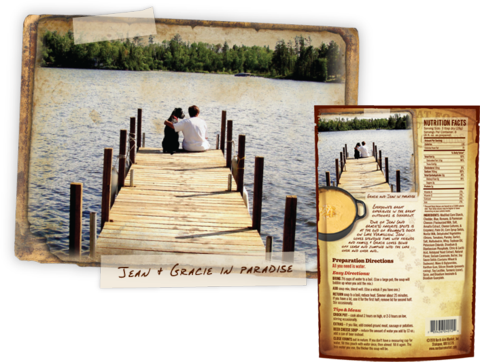 You will feel like you have soup from a fancy restaurant while enjoy mother nature in the great outdoors. See you by the fire! This entry was posted in Hunting, Product Reviews and tagged camp traditions, food for camping, food for hunting, soup mix. Bookmark the permalink.